We welcome you to the magnificent continent of Europe. Our Tour Manager will meet you at the arrivals hall after immigration. Welcome to the city of Paris. Please note the tour begins at 1500 hrs from Paris CDG Airport. Paris has a timeless familiarity for first-time and frequent visitors, with instantly recognizable architectural icons, along with exquisite cuisine, chic boutiques and priceless artistic treasures. We begin our tour of Europe with a visit to the most beautiful city of the continent. Later experience a panoramic boat cruise along the River Seine. With entirely glass topped vessels, these exquisite boats are constructed to explore the breathtaking views of the Parisian monuments such as the Eiffel Tower, the Orsay Museum, the Notre Dame Cathedral, Paris’ own Statue of Liberty as well as many other landmarks. Enjoy a comfortable overnight stay at the hotel in Paris. Day free to explore Paris on your own OR take the opportunity to visit the famous Disneyland in Paris. Your one day one park pass allows entry to the intriguing Disneyland Paris. Disneyland® Park has big thrills and kid-friendly adventures for the whole family. among many more. Enjoy a comfortable overnight stay at the hotel. Today, we proceed to the Belgian capital, Brussels, which is the capital of the European Union. Belgium's fascinating capital, and the administrative capital of the EU, Brussels is historic yet hip, bureaucratic yet bizarre, self confident yet unshowy, and multicultural to its roots. All this plays out in a cityscape that swings from majestic to quirky to rundown and back again. Organic art nouveau facades face off against 1960s concrete developments, and regal 19th-century mansions contrast with the brutal glass of the EU’s Gotham City. This whole maelstrom swirls out from Brussels’ medieval core, where the Grand Place is surely one of the world’s most beautiful squares. We begin the orientation tour with the Grand Place along with the guild houses which is the central square of Brussels, apart from this we also see the Manneken Pis, Royal Palace, Royal Park, City Museum, Town Hall, Palace of Justice and the Museum of Fine Arts. We also take a photo-stop at the Atomium, which was built for the 1968 World expo. of Vesuvius, the fall of the Berlin Wall, the bullfight in Seville and many more. In total see 300 models and sites in a quite unequalled craftmanship. Enjoy a comfortable overnight stay at the hotel in Netherlands. Welcome to Amsterdam – one of the greatest small cities in the world. From Amsterdam canals to world-famous Amsterdam museums and historical Amsterdam sights, it is one of the most romantic and beautiful cities in Europe. Canal cruises are a popular way to see the city from the perspective of its canals. It has all the advantages of a big city: rich culture, lively Amsterdam nightlife, international restaurants, good transport - but is quiet, and largely thanks to its extensive canals, has a little road traffic. 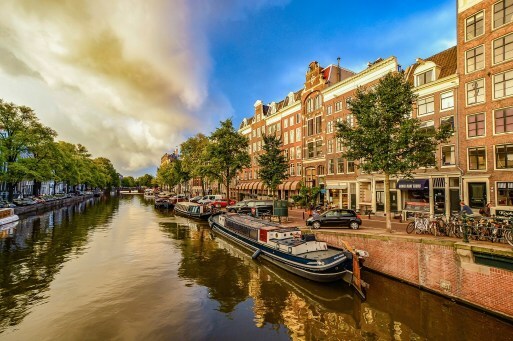 Enjoy a complete overview of Amsterdam and its beautiful architecture on the canal cruise. Soak in the quaint, relaxing atmosphere of the vibrant Dutch capital while cruising along the UNESCO World Heritage-listed canals. Learn interesting information about Amsterdam's highlights and uncover secrets behind each historical building. You’ll have plenty of time to take some great photos of some of Amsterdam's iconic sites such as the Royal Palace, the National Monument, St Nicholas Church, Munt Tower, the famous Golden Bend, the Skinny Bridge and much more!We also visit a wooden shoe factory of Holland and witness a free demonstration of the history, traditions and the making of authentic Dutch wooden shoes along with a visit to a Cheese Farms. After the demonstration, take a short stop for a photograph at a windmill, one of the most distinctive sights of the Netherlands. Enjoy a comfortable overnight stay at the hotel in Netherlands. After breakfast, we head to the city of Cologne in Germany as we visit the magnificent Cathedral which stands 157 meters tall, it also is one of Europe's most spectacular cathedrals and has to its credit being the largest Gothic cathedral north of The Alps. The twin spires and the beautiful stained glass windows are the highlights of this cathedral. The Cologne Cathedral also has the reputation of being the most visited tourist monument in Germany. Enjoy a comfortable overnight stay at the hotel. Water falls along with rolling hills dotted with old farm houses, the Black Forest is certainly a beautiful place to be. Some of the world's best-quality wood products and the world's prettiest and best-preserved forests are in this region. The Black Forest maids, Black Forest farms, Black Forest gateau, Bollenhut hats and Cuckoo clocks - the Black Forest embodies everything that one might expect of a picture-perfect German holiday. Later, we stop at Hofgut Sternen in the heart of the Black Forest to witness how the famous and original Cuckoo Clocks of Hofgut Sternen are made. Later, we proceed to Switzerland, which is a landlocked country in the cultural and geographical centre of Europe. Renowned for its snowbound Alps, lush green meadows and fresh water lakes, the prosperous country of Switzerland is blessed with a distinct character and dynamism, along with the gorgeous hills, cascading waterfalls, fruit loaded orchards and green blossoming gardens, the beauty of the nature in Switzerland is simply remarkable. We proceed to Zurich for an Orientation tour which includes sights such as Bahnhofstrasse which is the main downtown street and one of the world's most expensive and exclusive shopping avenues. We also see the Gross Munster, the Frau Munster and St. Peter's Church which are among the main churches of Zurich. Along with this, we see the Rathaus, which is the townhall of Zurich. We also proceed to Schaffhausen to visit one of the largest waterfalls in Europe, the Rhine Falls, witness the stunning natural beauty around these beautiful falls. Enjoy a comfortable overnight stay in Switzerland. containing Europe's largest glacier and a range of classic glacial features, and provides an outstanding record of the geological processes that formed the High Alps. Tourists are often amazed at the scenic splendour they witness from the Cog-Wheel train that climbs up to a height of 11,333 feet to reach Jungfraujoch, the highest railway station in the world. The Cog- Wheel train is one of the best, most incredible train journeys in the world. The views of Switzerland from atop the mountain are amazingly panoramic and breathtaking. Later, we drive to Interlaken, which lies in the Bernese Oberland on an alluvial plain, between Lake Thun and Lake Brienz and is surrounded by sparkling streams, fantastic waterfalls and an extraordinary mountain scenery including the famous peaks of the Eiger, the Moench and the Jungfrau. Interlaken is the adventure capital of Europe. Enjoy a comfortable overnight stay at the hotel in Switzerland. Today, after breakfast, we proceed to Mt. Titlis. The 45 minute ride across 2 cable cars is awe-inspiring as you'll witness the scenery change from green meadows and scenic lakes to snow clad mountains. The last leg of the ride is on the famous Rotair, which is the world's first revolving cable car that offers an awesome 360-degree panoramic view of the snow-covered valleys, glaciers, lakes, forests, and mountains in Switzerland. watch or jewellery, fashion or stylish accessories. The Old Town is pedestrianised, and the lively new part of town also boasts a good selection of shops with artisan produce, plants and handicrafts. Enjoy a comfortable overnight stay at the hotel in Switzerland. We proceed to Innsbruck, the capital of Tyrol. This city has the most picturesque backdrop, nestled in the gorgeous deep valley of the River Inn. It is an an amazing town with a rich history that is evident through the large number of museums and landmarks. On arrival, proceed on an Orientation of Innsbruck seeing sights such as Goldenes Dachl, Helblinghaus, Stadtturm, Triumphforte, Hofkirsche and Hofburg. Later, we proceed to Swarovski Museum, which is known for its amazing collection of precision-cut lead crystal glass. Witness a crystal-themed indoor park, different special exhibitions, a series of classic concerts where a glittering world of crystals awaits you. Enjoy a comfortable overnight stay at the hotel. Today we head to the most romantic city in Italy, known for its famous gondola rides and its amazing architecture. That’s correct ! Venice ! which is known as the Queen of the Adriatic. Also fondly called La Serenissima, Venice is built on 180 islands that are connected by over 400 bridges, with hundreds of canals criss-crossing the town. We take a boat ride to reach Venice Island enjoying the scenic view as we pass the famous bridge of Sighs and the Basilica di San Marco and head to St Mark’s Square where we witness sights such as the Bridge of Sighs, the Ducale Palace, St. Mark's Basilica and the Clock tower which are part of this romantic city. We also visit the Murano Glass factory where we have an opportunity to see how the Murano glass is made and see where the glass is handled to create fabulous designs. An expert master will create two objects with the most popular techniques, blowing and sculpture. Enjoy a comfortable overnight stay at the hotel. Later, we proceed to Pisa, where we visit the famous Leaning Tower of Pisa, known to be the bell tower of the Duomo Cathedral. One of Italy's signature sights, the Torre Pendente truly lives up to its name, leaning a startling 3.9 degrees off the vertical. The 56m-high tower, officially the Duomo's campanile (bell tower), took almost 200 years to build. Over time, the tilt, caused by a layer of weak subsoil, steadily worsened until it was finally halted by a major stabilisation project in the 1990s. Enjoy some spare time to a short stroll. Enjoy a comfortable overnight stay at the hotel. After a scrumptious breakfast, we proceed to the eternal city of Rome. Rome has a history over two and a half thousand years, as one of the founding cities of Western Civilization and has been a site of major historic events and has also been the cultural centre of Europe. Rome is so filled with Christian art and architecture, wonderful sights, cultural exhibits and so much more that the city will astound you. we begin the guided city tour of Rome which includes sights such as Colosseum, Arc of Constantine, Roman Forum and Caesar's Forum. We also discover many of the renowned attractions of Rome– the Trevi Fountain; the Victor Emmanuel monument on Piazza Venezia under which lies the Tomb of the Unknown Soldier with eternal flame. Later, we visit the Vatican City, the smallest republic in the world, we visit the St. Peter’s basilica which is the largest church in the world and the center of Christianity. Take a walk among the massive Tuscan colonnades of the St. Peter’s square. Enjoy a comfortable overnight stay at the hotel.